Let's imagine how the implementation of the health care bill might have gone differently. When the Affordable Care Act passed in 2010, President Obama would have created a temporary agency to implement it, including representatives of the AMA, the health insurance association, associations of hospitals, and patients' rights groups, as well as the Secretary of Health and Human Services, the Secretary of the Treasury, and an official from the Office of Management and Budget. Everyone selected from the private sector would have taken a leave of absence from their day job and most of them would have served for $1 a year. The most famous dollar a year man would have been Jeff Bezos of Amazon.com, who would have been given the job of supervising the development of healthcare.gov. He would have brought some of his staff with him and made use of all the techniques they had used to turn amazon into what it is today. By the time of the roll-out in October 2013, the site would have been running smoothly, and insurance companies would be using it to communicate with their customers as well. Meanwhile,. the Health Care Authority would be turning out suggestions for making care more efficient and cheaper, as well as more affordable. If all this sounds fantastic to you, you might want to brush up your history. 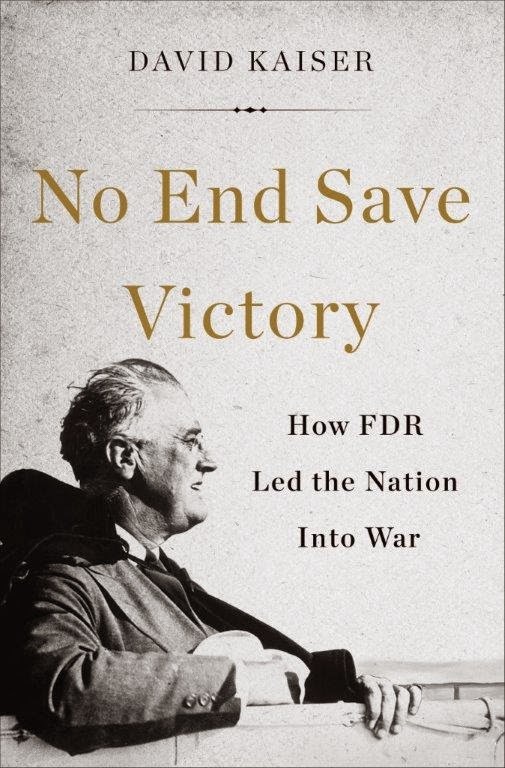 Specifically, you might want to think about purchasing my new book, No End Save Victory: How FDR Led the Nation Into War, when it appears in April. Why? Because that is how the United States, facing a far more desperate situation, dealt with the thread of world war in 1940-1. The rearmament effort began in late May of 1940, while France was collapsing and England was threatened with invasion and defeat. That was, in essence, the equivalent of 2010 when the ACA was passed. Four years later, in 1944, the decisive offensives against the Germans and the Japanese began. The Affordable Care Act will go into effect after four years as well, but its prospects are most uncertain. Here, by the way, is the cover of my forthcoming book. Let me fill in some of the blanks. The New Deal from the beginning was based upon creating new government agencies to solve pressing problems. The most successful were the Agricultural Adjustment Agency, which saved American agriculture by controlling production; the Public Works Administration (PWA) and Works Progress Administration (WPA), which put people to work; the SEC; and the National Labor Relations Board, which presided over a massive expansion of the work force. When in the spring of 1940 it became clear that war threatened the United States, Roosevelt used the same technique. He created a series of agencies to stimulate war production: the National Defense Advisory Commission in the spring of 1940, the Office of Production Management in the following winter, and the Supply Priorities and Allocations Board in August 1941. All of them had the same key personnel: the Secretaries of War and of the Navy (there was no Secretary of Defense in those days), and leading industrialists and retailers who put their expertise to work. The Jeff Bezos of those years was William Knudsen of General Motors, an immigrant from Denmark who had worked his way up from the shop floor to be CEO of one of the world's largest corporations. Knudsen was to automobiles what Bezos was to on-line marketing: he had started his career setting up assembly lines for Henry Ford. The most critical problem in 1940, Roosevelt had decided, was to produce huge numbers of military aircraft. Germany was sweeping all before it in Europe with air superiority and superior tactics, and Roosevelt was determined that the U.S. must build an air force, as well as a navy, second to none. In typical fashion, he set a goal in 1940 of 50,000 combat aircraft--more than 20 times what was then available, and far more than the War Department had plans for. The aircraft industry was however in its infancy, and assembly lines were unknown. Knudsen went right to work, showing the aircraft industry how parts could be mass produced and assembled, and his fellow automakers began turning out aircraft parts in Detroit. By 1942 FDR's goal had been achieved, and in subsequent years it was exceeded. Asked in a Congressional hearing why he had given up $150,000 a year plus bonuses to work for nothing, Kundsen replied in January 1941 that the United States had been very good to him and he wanted to give something back. Another key figure in the new agencies was Donald Nelson, the Vice President for Merchandising of Sears, Roebuck. He turned out to be critical because he was used to making sure that Sears had the products it needed in stores and warehouses when they needed them--ideal training for preparing an army, navy and air force for war. After Pearl Harbor he was put in charge of the last supervisory body, the War Production Board. The Affordable Care Act, it seems to me, is in big trouble because, to begin with, no single person was really in charge of implementation. Ironically, that charge was also leveled against FDR's agencies before Pearl Harbor. Knudsen and labor's representative, Sidney Hillman, were co-chairs of the Office of Production Management. But FDR set things up that way for one simple reason: he wanted to be the ultimate authority, and that is exactly how he functioned, as I discovered, in 1940-1. President Obama does not seem to have the executive ambition that FDR had, but he could have found some one who did and made the implementation of the act their full-time job. Ideally that person would have combined political and executive experience. He or she would have known that success in organizing the new health care system could easily lead to a run for the White House. The ACA has also suffered, of course, because it does not command the overwhelming support from the American people that the rearmament effort did. While many Americans opposed entry into the war in Europe in 1940-1, very few indeed denied that the United States had to prepare for survival in a very dangerous world. As I show, they were willing not only to stand up forces of unprecedented size, but to raise taxes to pay for them. That is not, of course, the case today. The sacrifices the ACA demands of the American people are much, much smaller--it's not clear that, if properly implemented, it would entail any sacrifices for most of us at all--but a large portion of the people and one entire political party remain totally opposed to it. That obstacle might still have been overcome, however, if Obama made the implementation of the act, rather than its passage, the centerpiece of his administration, and recruited the human capital from both the private and public sector that he needed to make it work. This, clearly, he was not able to do--because he did not attempt to. We cannot recreate the world of 1940-1, and in many ways we would not want to. We do not, thankfully, face threats around the world comparable to Nazi Germany and imperial Japan. Yet it is a major theme of my book that we succeeded then because of a real sense of national purpose and common enterprise that FDR had managed to arouse while fighting the Depression, and it is impossible to look at today's world without feeling the absence of exactly that spirit today. The outcome of the crisis over the ACA is just as uncertain now as the outcome of the world war was in 1941. Next year, if millions of Americans suddenly enjoy coverage they did not have, it may upset the political balance in the President's favor. If on the other hand men and women who thought that they had secured insurance on healthcare.gov find at the doctor's office or the hospital that their insurance companies don't recognize them because the "back end" of the system had not been fixed, the effect may be just the reverse. Obama needed Jeff Bezos to make sure that didn't happen, but he didn't try to recruit him. He might have failed to do so in any case: I have no idea if Bezos has enough sense of the public good to respond favorably. Knudsen did, even though he was a Republican with no great affection for the New Deal. That is one of the many differences between the last crisis in our national life and this one. I have been this week reading the technological history of the first half of the 20th century and Knudsen rings a bell as well as airplane and automobile mass production. Ford was a real revolutionary until he got boring and GM took the helm with their flexible mass production- many types cars for many segments- like Bezos with Amazon a universal store. An interesting bit of trivia: 2.5 billion USD spent for radar research and it won the war. The manhattan project cost 2 billion Dollars and ended it. So radar was more important. Germany was not as organized in terms of technlogy research as USA-industry /govt./ universties in most areas working hand in hand with a govt. copordinator in the background(rockets /jets as German exceptions of being ahead) and concentrated on maneuverable diving fighters which won the blitzkrieg but lost to the US/british focus on mass production of bombers (I had an uncle who fought as a gunner in one of those). Living in Hamburg-fire bombed July 1943- I am quite ambivalent about mass bombing of civilian targets by Brtish. US tactic of bombing supply lines and factories was more humane and common sense but just like in Iraq, could not win the war without land troops. Air war is never enough. The people just put factories underground and get more determined as the British against German rocket Wunderwaffen terror. The general organization of the USA in the war was amazing and effective unlike nowadays and in comparison to Germany back then in the war more effective long term- Germany got an obvious head start. It is odd that the healthcare problem is one of hi-tech being continually forced on the population, upping costs with new tests and machines, extending life span and checking for every eventual sickness when insured and that the internet govt. website(more hi-tech) which should be a no-brainer is the bureaucratic speed bump keeping the program backed up. They might be better off with ink and paper applications at a local govt. office. Hi-tech is driving us. We should be controlling it, e.g. you aren't allowed to die a natural death, have to pay bills for you know not what tests as the doctor says it is good for you and the webite is screwed up. Looking at WWII and the prewar time with electrification (Tennessee Valley project /Stalinist industrialization) it all seems that we are just trying now as then to get a grip on our own inventions. the war was just a technology management program between the various countries. We are having massive growing pains still with constantly changing technology. Medical tech is a serious cost factor for our society and a moral issue for us as individuals. The USA is getting old and inflexible as a complete system and tech is more complicated all the time. Most people can't understand it. Earlier leaders like Knudssen could start from the shop floor as Bezos in internet as an entrepenuerial genius. Nowadays a Phd in some arcane area in a reaearch lab or a computer programming specialist is required to understand what you are doing and create new fields. This precludes a creative life style as steve jobs and other college droput billionaires led to get things going. This has long been the case since Edison's approach gave way to Bell labs but is perhaps more so now. Govt. red tape, demands for qualifications before you can start in the industry of choice, etc. stifle such personalities as Knudsen and Ford nowadays. I agree with Ray C Neill on the Obama /FDR comparison. You seem to feel that presidents should be able to enact sweeping legislation solely through the power of their personal will. But FDR in the 1930’s and LBJ in 1964 needed the astoundingly large Democratic majorities in congress in order do so. America has always had long periods of political stagnation like the one we’re in now that began 40 years ago, punctuated by brief periods of reform to correct the problems that festered for so long. It's as if the system was designed for a nation of procrastinators. From an objective perspective the American system looks designed to produce a cycle of stagnation/crisis. Now you seem to be saying that only the boom generation would dare criticize the constitution. I also heard Gore Vidal (b1925, fought in world war II) say that he thought the parliamentary system was a better system than ours. Of course, he was a radical critic of America in general, but also as Jackie’s cousin, and a close friend of the Kennedys (BTW if you haven’t heard his interviews with Robert Scheer (b 1936) on Youtube, you should because he confirms your belief that the Mafia killed JFK).